LAS VEGAS – The last time Ross Hill fought a bull in Sin City, it was an anomaly for the Alabama man. Hill suffered a devastating knee injury at the BFO Roughy Cup in December 2016, and it kept him out of action for a year and a half as he recovered. Now, Hill returns to the Nevada desert for the first time in two years, eager to get the 2018 Bullfighters Only Las Vegas Championship at the Tropicana Las Vegas under way. Before the creation of Bullfighters Only, he was one of the top bullfighters in the game competing at almost any freestyle bullfight that offered the opportunity. That was a decade ago, when the Thunder EquiGames was held in Las Vegas to showcase the top bullfighters at the time. The veteran bullfighter has played a major role in the development of Bullfighters Only, which was founded in 2015. In that three-plus years, BFO has become the premier freestyle bullfighting organization in the world, developing a true “action sport” in the Western industry. The BFO Las Vegas Championship offers the largest purse in freestyle bullfighting. The event winner will pocket $25,000, which counts toward the crowning of this year’s world champion – money equals championship points. The bullfighter with the most earnings at the end of the season will be the world champion and will earn an additional $50,000 bonus. 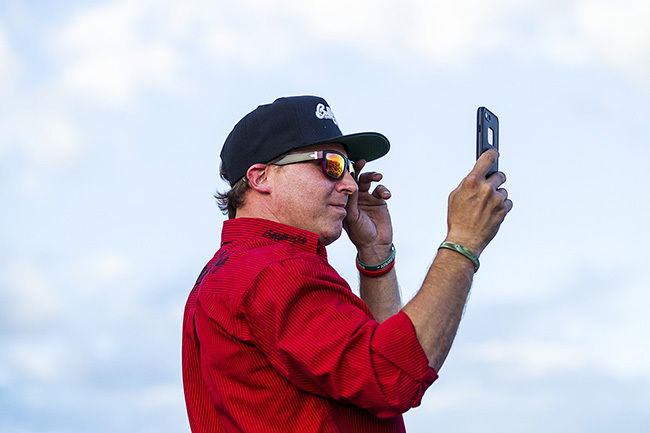 Hill is fifth in the Pendleton Whisky World Standings with $18,666, trailing the two-time reigning world champion Weston Rutkowski by $19,000. The money that’s available in the City of Lights offers Hill and others the chance to move to the top by the end of the 10-day festivities. He also maintains the youthful confidence that led him to past success Las Vegas. “I’m floating on the moon right now as far as my confidence goes,” said Hill, who didn’t start competing until mid-July and quickly moved into the top 5. “My workouts are going great. Basically, Kris Furr and Weston and I are working out twice a day. We have our travel trailers parked together in Decatur (Texas), so we work out at Fit N Wise together. That’s important for the athletes in the BFO. No matter the place, the BFO brings a noteworthy atmosphere with every live-show, and it is amped up even more under the bright lights of Las Vegas. That attitude is the perfect fit for the Las Vegas Championship.